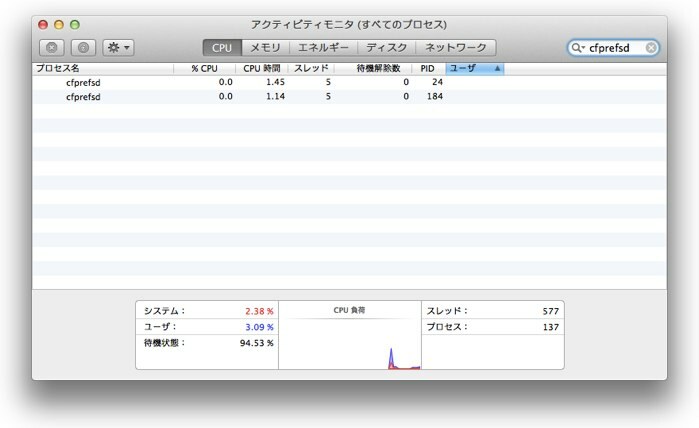 OS X Mavericksのcfprefsdに不具合（仕様変更？）があり、アプリの設定が消えたり、消えなかったりする？ | AAPL Ch. We hit the same issue many times. @MikhailT @roustem if you use NSUserDefaults, stuff isn’t written to the plist right away. cfprefsd takes care of it later, IIRC. The most annoying part is that clearing data with CFPreferencesSetAppValue & CFPreferencesAppSynchronize works for some apps and not others. @drspringfield Yeah, killall -SIGTERM cfprefsd works too, but the new behavior in Mavericks re: caching prefs leaves a lot to be desired. A breakthrough! In order to manually replace plists, I have to kill cfprefsd after copying the file. That seems to reset the cache. @hankdu More news: 10.9 caches prefs files globally. You may need to do this in Terminal: killall -SIGTERM cfprefsd — or reboot your Mac.